Working Across the Digital Entertainment Ecosystem to make strategic PR decisions for your business. 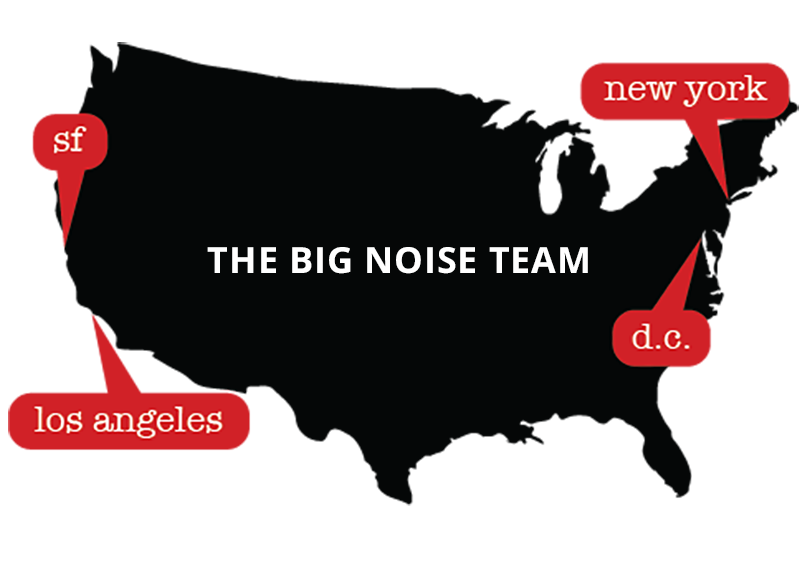 Big Noise PR is a San Francisco-based PR shop working with clients across the digital entertainment and media ecosystem to get their brand noticed and generate positive press. We develop strategic communications solutions for their brand, including their current and future content, products, services and technologies. We are addicted to storytelling, whether it’s through content, creative, insights and analytics, a product or a platform. And we are passionate about the ever-evolving places people can consume these stories. We are also interested in the burgeoning number of tools consumers and businesses can use to analyze, access and track digital content. With so many content, consumption and usage choices available today, brands need to command attention and that’s where Big Noise PR comes in. The Big Noise PR team understands the entertainment and media businesses and we get the latest technology. We can speak to the engineers as well as the agents and everyone in between. Whether you are an emerging or established business, Big Noise PR makes the right kind of noise to get you the right kind of attention from media and consumers. We work with businesses as an extension of their in-house team or as an external support system. Bronagh Hanley has introduced national brands and talent, evangelized new trends and products, premiered award-winning series and films and crafted company images and missions. 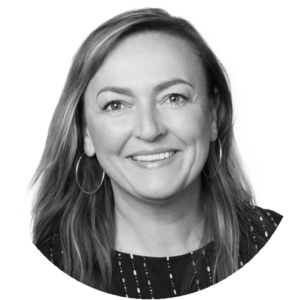 Over the course of her career, she has built trusted relationships with consumer, business and trade media across the U.S. and around the world who are interested in a great story. From Netflix and Curiosity Stream to NBCU and YouTube, Hanley has worked with high-profile and emerging media and entertainment companies that are defining the landscape. With a rare combination of entertainment industry experience and tech business knowledge, Hanley’s unique skill set puts her squarely at the intersection of entertainment and technology in this rapidly changing media world. Since diving into the PR world more than twenty years ago, Hanley has driven Roy Rogers around the country in an RV, hosted a screening of the infamous Jack Nicholson flick at The Shining hotel, witnessed the opening of the Medici family crypt in Florence with Morley Safer, launched the first home makeover show Trading Spaces, introduced Netflix’s pioneering streaming service with HBO and CBS, launched John Hendricks’ Curiosity Stream and put Ron Howard and Brian Grazer’s New Form Digital on the map. Hanley specializes in mapping strategy, finessing messaging, defining positioning, conducting media relations and formulating industry outreach. Prior to branching out on her own with Big Noise PR, she was the first-ever director of public relations for Netflix, where she built the consumer program from scratch, serving as a key member of the executive team that introduced streaming and helped the company grow from 3 million to 10 million subscribers in just three years. In addition, Hanley headed up the PR team that launched and promoted Netflix’s original content studio, Red Envelope Entertainment, premiering passion projects and independent films from filmmaking talent, including John Waters and Patricia Heaton. Prior to her West Coast move for Netflix, Hanley spent a number of years at Discovery Communications providing public relations counsel in several roles, including vice president of communications for Discovery Networks’ popular lifestyle channel TLC, where she launched two of their most successful and iconic series, Trading Spaces and What Not to Wear and was part of the management team that developed and introduced the Life Unscripted brand direction. Hanley was also director of communications for Animal Planet, where she spearheaded PR for the Animal Planet Original Movie franchise, as well as head of publicity for Discovery Pictures, which produced the longest-running IMAX film in the genre’s history, The Human Body. Hanley started her career in the agency world working on consumer projects for such clients as Pepsico and Kodak. Hanley is a member of The Academy of Television Arts and Sciences, International Academy of Digital Arts and Sciences, , the International Academy of Web TV, the Television Publicity Executives Committee, and the Hollywood Radio & Television Society (HRTS). She sits on the advisory boards of Syracuse University’s College of Visual and Performing Arts and social change organization DoSomething.org, as well as the advisory board for TMI Strategy and Kid Stock Inc. Hanley serves as a judge for the College Television Awards, the Webbys, the Shorty Awards, the Daytime Emmy Awards, the Streamys Blue Ribbon Panel and the San Francisco Web Fest and has served as a panelist and advisor for numerous industry conferences and events. Her long-term goals include writing a series and being a contestant on Jeopardy!. What makes Big Noise PR unique is its ability to be nimble in a changing and competitive landscape. Working with a smart team of freelance communications consultants around the country, Big Noise PR can scale up or down according to your needs, budget and timeline. We can serve as an extension of your staff, work as on-the-ground staff in cities around the country, manage all facets of your campaign or take a project off your hands and execute from start to finish. Led by Hanley, the team includes publicists, media trainers, strategists and event planners. It’s a one-stop publicity shop for your PR needs.